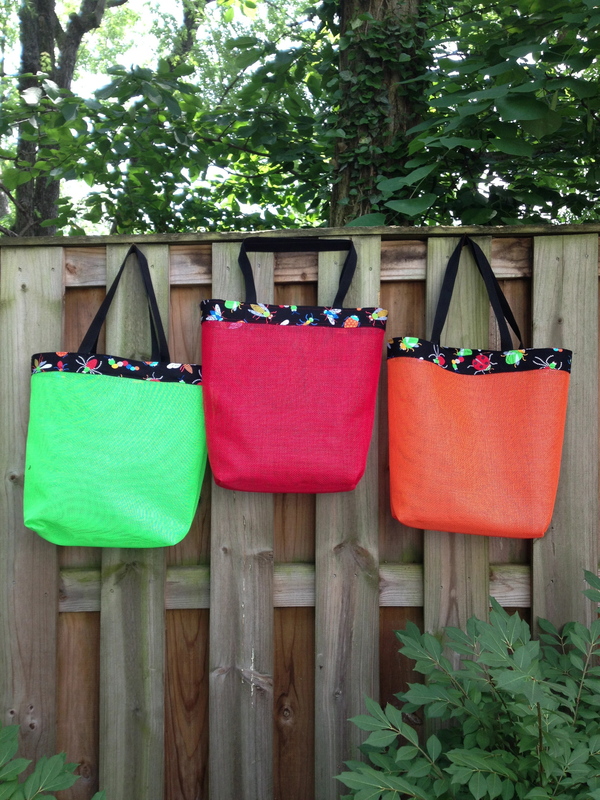 I made these 3 mesh beach bags recently for my nephew’s 3 little boys (ages 2 – 6). I thought they would be the perfect thing to carry their beach toys in. 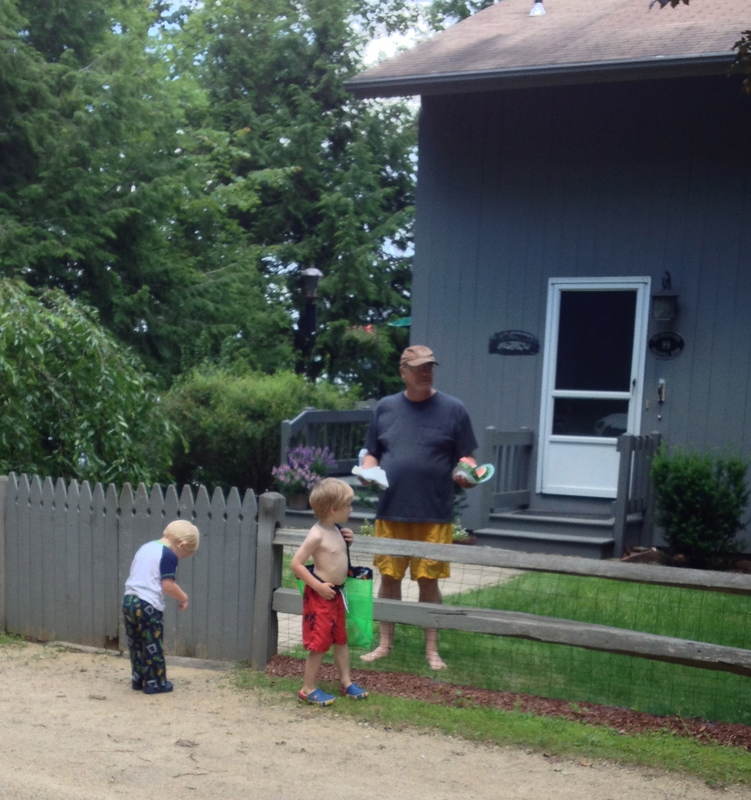 When they were done playing with them, they could throw the toys back in the bag and just give it a little shake to get rid of the sand. I bought the colored mesh at a local quilt store. Colored mesh comes in a roll that is 18″ x 36″ for about $5.50. Don’t you love the bug fabric? It was perfect to use with all 3 colors of the mesh. This was a very simple project. I folded the mesh in half and sewed down the sides. Luckily my friend, Jan, had previously made a similar bag and suggested I sew the side seam with a french seam. This creates a smooth edge to the inside seam instead of something jagged that would possibly hurt little hands or catch on the toys or towel that you’re trying to get into or out of the bag. Next was to box the bottom corners. This had to be done as a regular seam. I sewed across the bottom corners and then cut the excess mesh. I did do a zig zag stitch over the seam edge to give it some extra strength. 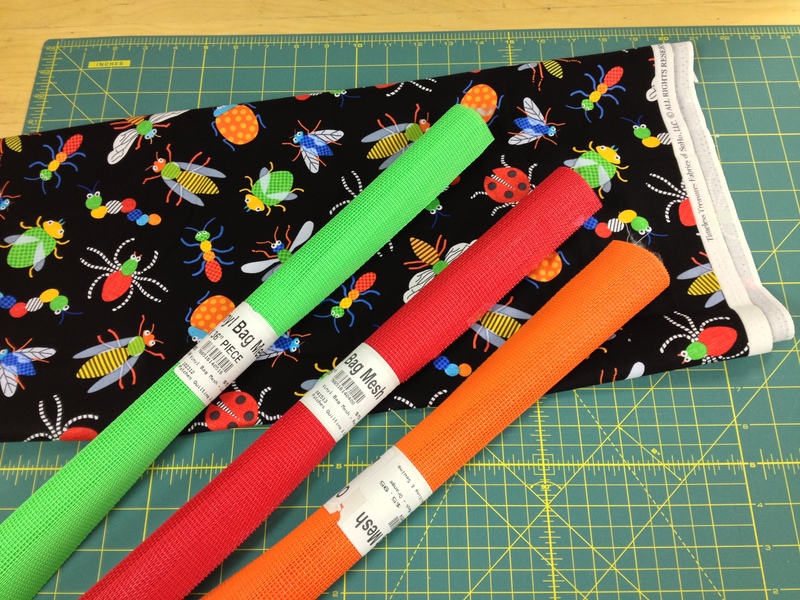 The bug fabric was cut into 2 inch strips x WOF. I sewed 2 strips together lengthwise and then ironed the opposite raw edges under about 1/2 inch. I laid this right over the top of the mesh, marked exactly where the fabric should be joined to form a circle the width of the bag and then removed it and sewed this seam in the fabric. I’m afraid I don’t have pictures of this step. I think I got so excited about finishing up the bags so quickly, that I forgot to take more pictures! 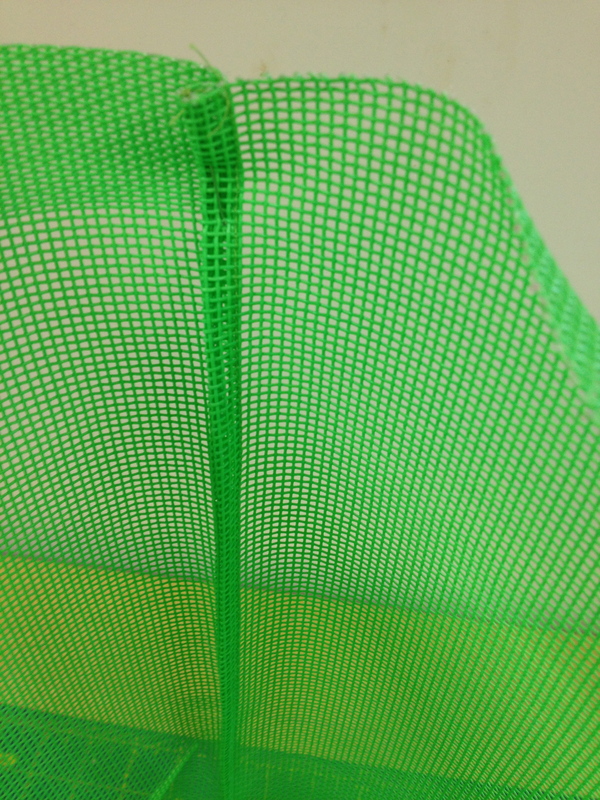 The fabric was placed back on the top of the bag so that the mesh is right up against the top of it. I edge stitched around both the top and the bottom of the fabric strip. Black webbing was used for the handles and secured onto the inside of the bag with both a square and an X in machine stitching. I can see why the boys loved them. They are adorable with the bug fabric and practical. That is such a great idea Linda! Thanks! I started them at the DCMQG retreat and finished them at home. It probably took less than 2 hours to make all 3. What a great gift for kids to go for the summer…. 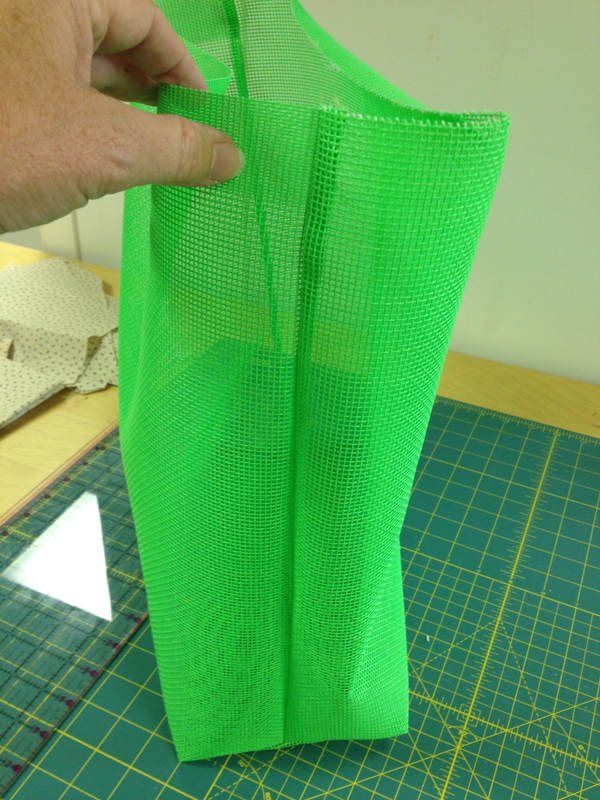 I love a project like these mesh bags that are so quick to make up and useful! 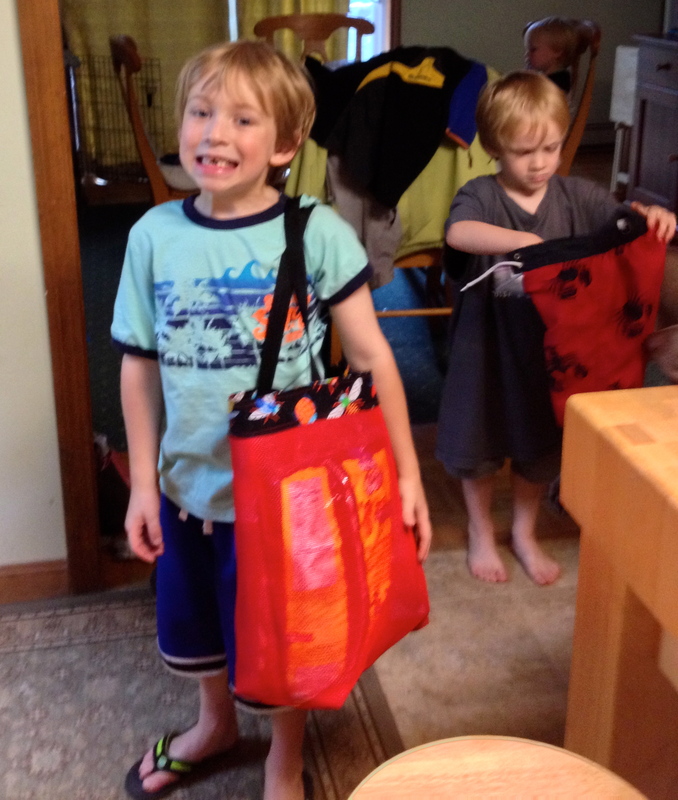 Jan’s bag included a fabric zippered pocket which would be great for an adult but didn’t seem necessary for these boys. Love them and so did the boys!! 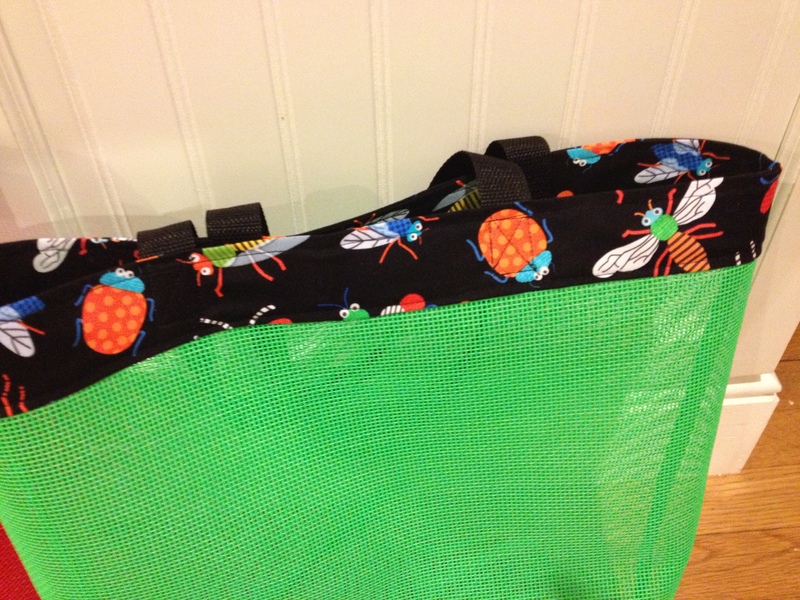 The bug fabric is pefect!